We went helmet shopping yesterday. After two trial sessions with horse therapy, we were confident enough to buy Claire her own equestrian helmet. Furthermore, we decided to double down on horse therapy: Claire will have two sessions each week beginning this Monday. The horse therapy has been a great addition to the rehabilitation tactical battery. We’ll take all we can get. September has brought all kinds of forces to north Texas. Thunderstorms, tornadoes and cooler temperatures are the least of our concerns. The perennial allergy season has darkened our doorway. We never like it and this season it’s more menacing. Heidi, Claire and I have been the most effective. Despite a vanguard composed of Zyrtec and Flonase, Claire’s respiratory system has taken a beating; yet it has not gone down. All the junk in her airways remains an upper respiratory nuisance, and hasn’t descended further to become something more menacing. We’re thankful for that and continue to check and monitor her oxygenation levels and lungs. So far, so good. 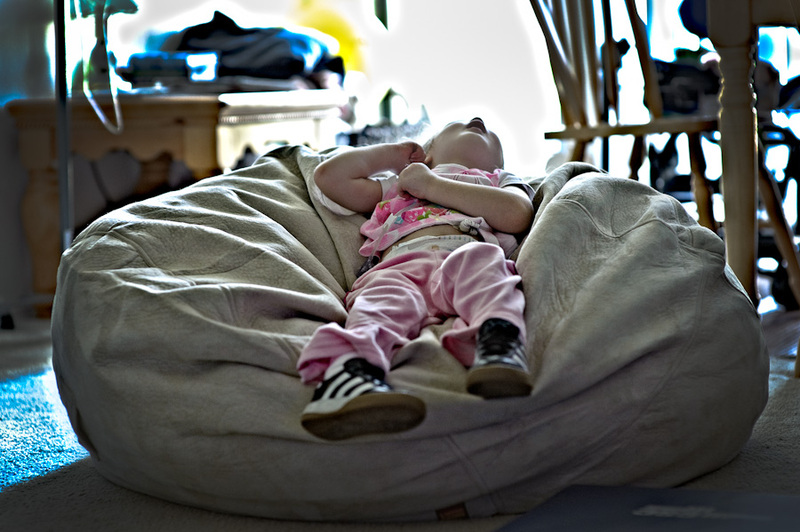 Claire’s chair – a Lovesac – has been awesome. She relaxes very well with the chair, especially compared to the alternatives we were using. It’s also much easier to keep her elevated in the chair while she eats. We’d been using our wedges to elevate her while she ate; however, Claire’s core strength increased to the point she was able to easily roll off the wedge. The new solution is much improved. When Claire is not using her chair, it’s not unoccupied for long. Heidi and Autumn like to sneak their way onto the chair. I’ll steal onto it too from time to time. Claire has shown small improvements over the past few days. Her neck muscle strength has improved. She is holding her head up with more consistency and control. Claire’s therapists were very pleased with her head control today. Tiffany ventured that today’s therapy session was the best to date. Claire was calm, cooperative and attentive. The therapists remarked that Claire worked very hard. Since that’s all we’re asking of her, we were very pleased as well. We’re happy to see the end of this short work week tomorrow. We decided to start some projects early. Heidi wanted to learn some more photography principles today, so we set up the camera and did some portrait work with a ready and willing subject. We felt we captured the essence and mood of the moment. We hope you enjoy tomorrow and have a great weekend. Thank you as always. I never knew I could fall in love with a family I’ve never met. I look forward to your updates. To see and now feel the strength, determination, weakness and resolve of your beautiful family is so amazingly beautiful. You continue to be surrounded in prayer. We rejoice and cry with you. Know you all are so very loved! I like the new look & the great pictures. Lil Miss Claire looks so alert & focused! Thank you for letting us be a part of Claire’s recovery process. This really made me smile! I’m so glad the Horse Therapy is working and that Claire seems to be settling into it more! Keep taking those babysteps Claire! There are so many people pulling for you sweet girl! Love the Sock Monkey! That was one of my favorites growing up! Hope to see you soon!! Sweet Dreams tonight! Love and Prayers to all of you! Love the sock puppet/monkey photo! Good job Heidi! We continue to pray for you all… feel as if we know you even though we do not. Blessings! Praying for more “best ever” therapy sessions. Claire is precious as are her parents and sisters. Hang in there. Claire is worth it. I have sat quietly in the background reading your posts from the beginning- and praying. I have a 5 year old son so I put myself in your place and feel the pain. I know it is not the same intense pain you feel on a daily basis, but it makes me wonder how you are able to get our of bed each day. I guess you have to- so you just do it. I hope that you continue to be blessed and can stand strong. Tyler- take care of yourself so you can take care of your girls. My good friend Denise has an acupuncture practice in old town Coppell. She has had much success in treating a man with a severe brain injury. She can give you much more detail and is a low key, kind soul, who I believe you would enjoy gathering information from. Her contact info is below if there is interest on your part. I am so glad the horse therapy is going so well. There is just something special about horses, they seem to know when you’re needing them to be extra gentle. I continue to keep you all in my thoughts and prayers! was set up for his grandson,who has autism. The rates are very reasonable, compaired to the extremily high rates in the hospital. He told me there is another clinic in Richardson Tx. like his. Ask for a Dr. Johnson, Telephone # 972-238-7333. This might be closer to you. They have had success with near drowning children. Thank you for sending the information. We are familiar with the Richardson facility and HBOT. This alternative treatment is one we continue to evaluate and consider. We have to way the opportunity costs for all options — primarily time and money. The positive side of HBOT is that it has been around a long time; therefore, it has a large body of data from which to pull. We have to weigh the opinions of medical professionals regarding HBOT and treatment for anoxic brain injury. Right now we have chosen to focus on the therapeutic efforts that yield the most impact. We unfortunately cannot try everything: time and money is scarce and there’s no way to do everything in a day. week or month without making the difficult decision of borrowing time from another activity. We have not ruled out HBOT; however, at this time, we are not aggressively pursuing HBOT. Please know that we read all the comments. We’ve read each of your comments with your recommendations. We appreciate the feedback. Seems the Martin Family have a gentle humor that retains your strength. Creativity is a great release. I am so excited to hear about Claire’s small achievements that will lead her towards a beautiful recovery. Go Claire Team! I think you should submit your photo to a contest; don’t know if some children’s magazines might have such a thing. It’s an excellent photo! Claire looks the most alert I’ve seen. Great work is being done by her and for her. We pray from Colorado for all of you, and your messages about Claire and your family are a blessing to us. Following up on the acupuncture and hyperbaric treatment suggestions, I was also wondering if you’ve got a chiropractor on your team? 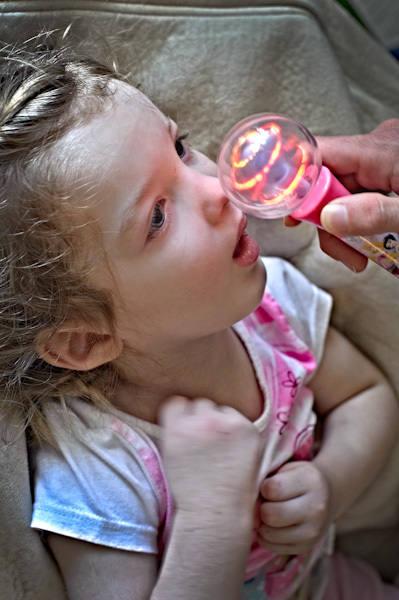 My husband and son have regular seasonal allergy problems and our chiropractor “cleans us out” for hours at a time with gentle manipulation, pressure points around the head and nose and “thumping” with a massager for the chest and back. It might help make breathing easier for everyone. Looking forward to hearing about more good news and lighthearted moments. Just settled into my room here in Texas and can’t wait to see you and Claire’s progress in person. Another blessed day. Bringing blessings from California to you all in the morning! The picture is great, you are an artist in the making. You made me laugh. Hope school is fun and keep taking great picture. For some reason I am weeping as a result of reading your post combined with the photos. I am filled with hope this morning as to the type of recovery Claire will experience in the months and years ahead. God extends mercy to us in a plethora of expressions. Let us all open our hearts and heads to His designs on our lives. Ummm….that photo is awesome. Tell Heidi that I made it the background on my cell phone. Love this. Even when I’m not consciously praying for you, you all hover on the edges of my thoughts and I long to know how you’re doing. I’m so pleased that the hippotherapy is going well. We’re big fans. Very artsy portrait. Heidi captured the “essence and mood of the moment” to a tee. She’s a natural. Glad to hear that therapy went well. Her new chair looks quite comfy too. I have to say, I think the last photo is awesome! It brought a smile to my face to see something cute like that! Thinking of you in CT!! We are so encouraged by Claire’s progress. Small steps are good. It reminds us of the proverb ‘ A journey of a thousand miles…….’ Many small steps make up big progress. We especially like the sock-monkey picture. It was one of my (Gramps) favs some fifty years ago. I know that each day is challenging for you both. It must feel like you are on a thousand mile trek with a fifty lb. pack on your backs. Keep up the good fight! You will reap many rewards for Claire, yourselves, Heidi and Autumn. Ur still doing beautifully; so thrilled about the horses! it was a tough night last night : 6yo Kate McRae, parents Aaron & Holly, had an MRI post long cancer treatment; Holly tweeted “heartbroken…” tears rolled down many cheeks including the Women of Faith team at the Honda Center in So Cal..they prayed immediately. We’ve had great success in our family using Noni, 100% relief w no side affects; the best quality I’ve found is from The Premiere Center 1-310-320-1132, not expensive. Chinese herbalists are also excellent at treating allergies. 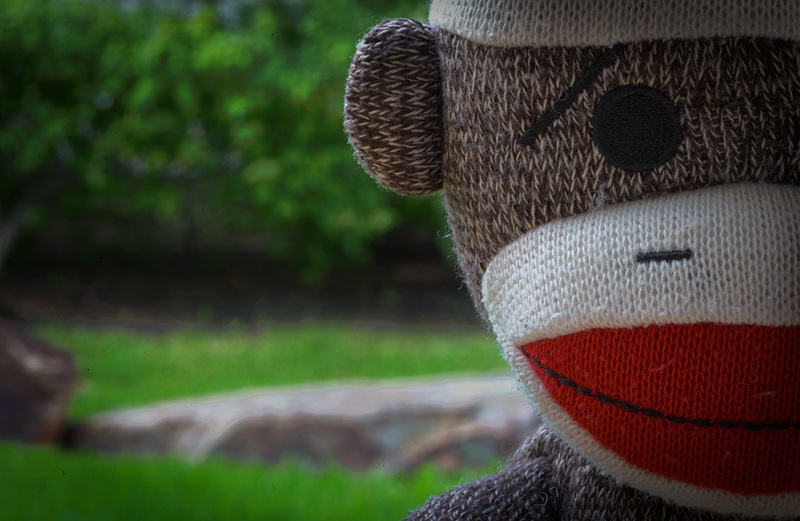 I love the sock moneky picture – so many unspoken words. It sounds like life is gettting closer and closer to your new ‘normal’. Although I’m pretty sure this probably not what you want, I wish you all peace and comfort. Tyler and family, I am sorry I have not been in contact with so long! My phone crashed and I lost all of my contacts. Call me when you get a chance. I am thrilled to see the recent pictures of Claire! She looks amazing, but I would expect nothing less when she is surrounded by such a wonderful family. Your whole family is amazing!